Check this out. The original Mazda RX7's air conditioning unit seriously sapped power. Remember, this little Japanese sports car had a Wankel rotary engine up front, a handbag-sized three-piece Wearing Blender that stumped-up just 135 hp (or, with the chiller engaged, less). That meant, if you happened to encounter a late '70's Yank tank spoiling for a fight, you'd reach-up and press the little button that turned the AC off. The RX7 bucked slightly, as the engine regained lost vigor. You kinda felt like Mad Max, spooling-up his supercharger on the last of the great V8 Interceptors, only you know, in reverse. The '78 RX7 was certainly a welcome weapon for cash-strapped, sports car-starved Americans. And it came from an unexpected source. The Mazda RX2 and RX3 were odd-looking ducks whose Wankels were only slightly more reliable than Ethiopian train service. Mazda's twin-rotor RX4 was largely de-goofy-fied and mechanically sound - and arrived just in time for the Arab oil embargo. (A properly-flogged RX4's thirst was prodigious.) And then Mazda engineer Akio Uchiyama and Mazda Board member Sinpei Hanaoka came to the same conclusion: rotary engined sports car. Project X605 was born. The car's defining accomplishment was, of course, its engine. Sure, the RX7's taut, unadorned sheetmetal put the brand back into the game, but the itsy-bitsy Wankel made that wikkid hood line possible. The powerplant's compact dimensions, along with a single piece monocoque bodyshell, helped create one of the lightest, best-balanced sports cars extant. Air slicing aerodynamics and a well-sorted Euro-style suspension — McPherson struts and coil springs (front) and live axle with Watt's linkage (rear) — kept the RX7 stable at speed. There were even disc brakes up front. And it didn't cost a lot of money: $6395 without mud guards or undercoating. On the road, well, today's Ferrari and VTEC drivers know the joys of caning a smooth-spinning, high-revving powerplant. The RX7 was the grand daddy of them all. As you might expect from an 1146cc mill, low-end torque was notable by its absence. But once you crested 3500rpm, the mainsails unfurled and it was brisk sailing all the way to the 7000rpm redline. In scientific terms, the RX7 was no match for a muscle car. Series One cars sprinted from zero to sixty in a shade under nine seconds. But the RX7 was one of those admirable machines that could carry any and all speed generated with complete self-assurance. You could eventually catch and outmaneuver just about anything on the road. Saying that, the steering was a big chink in the RX7's dynamic armor; the recirculating ball helm felt dead at the straight ahead and more numb than a vodka-soaked WASP through long sweepers. Like the previous-gen BMW M5, the RX7 was only a rack and a pinion away from greatness. Well, that and a bit of shove. 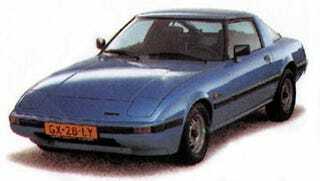 For the next generation RX7 ('81), Mazda installed a more powerful 13B rotary and fitted discs at all four corners. It wasn't enough. Porsche, Datsun, Chevrolet and even Ford came-up with new and better answers. Mazda kept after it, bolting on a turbo and offering a convertible. And then they built a no-holds-barred twin-turbo third-gen RX7, a car that could well be the hardest riding — and one of the most capable— sports cars on planet earth. And then they built the quirky RX8. Somewhere along the line, Mazda lost the purity of the original RX7 — so much so that the company had to build the Elan-a-like MX5 to recapture it. It's a shame. The three-piece rotary engine is a magnificent design that deserves a better home than the current RX8. I'm sure there are plenty of good reasons why Wankel's baby is a virtual orphan, but I wonder what Mazda's engineers could do with the latest rotary technology, a clean sheet of paper and a bunch of pistonheads riding shotgun.